In December of 1965, three public school students – John and Mary Beth Tinker and Christopher Eckhardt – in Des Moines, Iowa, were suspended from school when they wore black armbands express their opposition to the Vietnam War. Although the armbands expressed a legitimate viewpoint on an important political issue, the students were sent home for violating school policy and were not allowed to return to school until they agreed to remove their armbands. Rather than meekly accepting their punishment, the students challenged their suspensions on constitutional grounds. As predicted by many commentators, both the federal district court (Tinker 1966) and the United States Court of Appeals for the Eight Circuit (Tinker 1967) ruled in favor of school officials. The United States Supreme Court, however, reversed the lower courts and ruled in favor of the students in Tinker v. Des Moines Independent Community School District (1969), a landmark decision recognizing the student’s First Amendment rights. Writing for a 7-to-2 majority, Justice Abe Fortas noted that the armbands were a form of symbolic expression “within the Free Speech Clause of the First Amendment,” that such symbolic expression is “closely akin to ‘pure speech,’” and that neither students nor teachers “shed their constitutional right to freedom of speech or expression at the school house gate” (Tinker 1969, pp. 505-506). Although Justice Fortas believed that student speech should be protected, he also recognized that there were instances in which it might be suppressed. In an effort to delineate these circumstances, Justice Fortas noted that student speech could only be limited by demonstrating that it would “substantially interfere with the work of the school or impinge upon the rights of other students” (Tinker 1969, p. 508). Particular attention must be paid, Justice Fortas continued, to distinguish between legitimate regulation of disruptive student speech and efforts to “avoid the discomfort and unpleasantness that always accompany an unpopular viewpoint” (Tinker 1969, p. 509). To insure that school officials did not engage in any content-based discrimination, Justice Fortas called on federal judges to independently review the facts and determine whether there was sufficient evidence to justify suppressing student speech. Since Tinker was the first decision to extend speech rights to public school students, it is widely celebrated as a ringing affirmation of the importance of the freedoms guaranteed by the First Amendment to the United States Constitution. According to the majority opinion, students do not relinquish their speech rights when they enter a public school. Over time, however, the bold affirmation of student speech rights in Tinker has been undermined. Although the Supreme Court has never overruled or qualified the holding (Miller 2002, p. 640), lower court decisions have effectively reversed the decision. A precedent that was once offered to justify protecting student speech rights is now being invoked to justify limits on student expression. This analysis treats these interpretations of Tinker as an exercise in definitional argument and explores the argumentative moves made in these consequential decisions. By diluting the rigorous definition of “disruption” originally set out by Justice Fortas, federal courts have endowed school officials with a broad authority to suppress student speech. At the same time, by deferring to school officials all questions related to disruption, these decisions guarantee that the students will fail in their efforts to seek legal regress. This result illustrates the power of definitional argument and, more importantly, provides insight into the tenuous nature of student speech rights. Argumentation theorists have long recognized the importance of definitions. In their influential work, The New Rhetoric, Chaim Perelman and Lucie Olbrechts-Tyteca (1969) observed that “the argumentative character of definitions always presents two closely connected aspects which must nevertheless be distinguished, since they deal with two phases of the reasoning; definitions can be supported or validated by argument; they themselves are arguments” (p. 213). Not surprisingly, definitional arguments are particularly common in law, as court cases often hinge on subtle interpretations of the language of statutes or the nuances of legal doctrine. A complete summary of the work on definitional argument is beyond the scope of this analysis. The intent here is not to add to this literature, but rather to offer a case study illustrating the way in which definitional argument is employed in the ongoing controversy over student speech rights. The definition in play, as noted at the outset, is the meaning of the disruption standard originally set out in Tinker v. Des Moines. What is interesting for the purpose of this analysis is that Tinker was an easy case. Both parties essentially stipulated that the armbands were not disruptive. This allowed Justice Fortas to introduce a disruption test without explaining how the test might be applied in practice. As those familiar with American constitutional law know, Tinker was one of the last cases decided by the Warren Court. Even before the decision was announced, Chief Justice Earl Warren had announced his retirement. President Lyndon Johnson, a Democrat, nominated his friend and political ally, Associate Justice Fortas, to be the new Chief Justice. Republicans in the Senate blocked the nomination by staging the first filibuster of a Supreme Court nominee. When the motion for cloture failed to achieve the necessary two-third majority, President Johnson withdrew Fortas’s nomination. The next president, Richard Nixon, nominated Judge Warren E. Burger to be Chief Justice and the Senate quickly confirmed him. Justice Fortas remained on the Supreme Court for another year, but a financial scandal forced him to resign in 1969. Due to appointments made by Republican Presidents, the progressive Warren Court (Horowitz 1998) gave way to the more conservative Burger Court (Blasi 1983), which gave way to an even more conservative Rehnquist Court (Savage 1992). Based on decisions to date, it appears unlikely that the Roberts Court will reverse the trend to the right (Chemerinsky 2007). From the vantage point of the present, it is now recognized that Tinker was the “high-water” mark for student expression (Chemerinsky 2004, p. 124). The Supreme Court has not, however, explicitly overruled the Tinker decision. With the notable exception of Justice Thomas’s concurring opinion in Morse v. Frederick (2007), the Justices have treated Tinker with deference for more than forty years. While Tinker remains good law, school officials have prevailed in the overwhelming majority of cases involving student speech rights. To achieve this result, judges interpreting Tinker have engaged in a form of definitional argument. By making two distinct argumentative moves, these lower court decisions have effectively undermined one of the notable decisions of the Warren Court. The first of these moves involves the use of “persuasive definitions,” a tactic originally identified by Charles L. Stevenson (1938, 1944). As explained by David Zarefsky (1998), “a persuasive definition is one in which favorable or unfavorable connotations of a given term remain constant but are applied to a different connotation” (p. 7). In the case of student speech, this was done by subtly broadening the definition of disruption from student speech that is actually disruptive to include student speech that is potentially disruptive. This may seem an inconsequential distinction, but it has had dramatic consequences for students who seek relief in federal court. By broadening the definition to include speech that might potentially be disruptive, federal courts made it easier to demonstrate disruption, thereby diluting the constitutional protection that Tinker provided to students. The second move involves the authority to define. 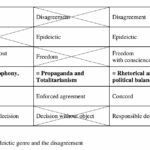 While the argumentation literature recognizes “the power to persuade is, in large measure, the power to define” (Zarefsky 1998, p. 1), case studies involving definitional argument often highlight the language being manipulated. While the definitions are important, Edward Schiappa (2001) has encouraged argumentation scholars to think more broadly about the power to define. “Our lives can be profoundly affected by such decisions,” Schiappa posits, “since the question of who should have the authority to make definitional decisions amounts literally to who has the power to delineate what counts as Real” (p. 26). In the case of student speech, lower court decisions marginalized Tinker by broadening the definition of disruption to include anticipation disruption and, at the same time, by delegating the authority to decide whether student speech might be disruptive to school officials. Either move, taken by itself, would arguably have been insufficient to achieve the desired result. In combination, however, these moves make it easy to justify restrictions on student speech or to rationalize the punishment of a broad range of expression. To illustrate the importance of definition, it is necessary to return to text of the Tinker decision. Once he set out the new standard for assessing student speech, Justice Fortas turned his attention to the facts of the case. Since the armbands did not interfere with the “rights of other students to be secure and to be let alone” (Tinker 1969, p. 508), the only question was whether the armbands were disruptive. Not surprisingly, the answer to this question was woven throughout the majority opinion. Early on, Justice Fortas noted, “Only a few of the 18,000 students in the school system wore the black armbands. Only five students were suspended for wearing them” (Tinker 1969, p. 508). There was, moreover, “no indication that the work of the schools or any class was disrupted. Outside the classrooms, a few students made hostile remarks to the children wearing armbands, but there were no threats or acts of violence on school premises” (Tinker 1969, p. 508). To substantiate this claim, the opinion stresses that the “District Court made no such finding, and our independent examination of the record fails to yield evidence that the school authorities had reason to anticipate that the wearing of the armbands would substantially interfere with the work of the school or impinge upon the rights of other students” (Tinker 1969, p. 509). To cinch the point, Justice Fortas observed, “Even an official memorandum prepared after the suspension that listed the reasons for the ban on wearing the armbands made no reference to the anticipation of such disruption” (Tinker 1969, p. 509). In the final substantive paragraph of his opinion, Justice Fortas marshals the available evidence to support a definitional claim: “The record does not demonstrate any facts which might reasonably have led school authorities to forecast substantial disruption of or material interference with school activities, and no disturbances or disorders on the school premises in fact occurred” (Tinker 1969, p. 514). This sentence is significant because it clearly states that only a “substantial disruption” or “material interference” can justify limiting student speech. In the words of Erwin Chemerinsky (1999-2000), “Mere fear of disruption is not enough. The burden is on the school to prove the need for restricting student speech and the standard is a stringent one: there must be proof that the speech would ‘materially and substantially’ disrupt the school” (p. 533). There have only been three Supreme Court decisions dealing with student speech rights in the forty years since Tinker was decided. While each of these cases is important, none offers new insight into the disruption test. In Hazelwood v. Kuhlmeier (1988), the Supreme Court considered whether school officials could constitutionally review a student newspaper prior to publication. While the Court ruled in favor of the school, Justice Byron White’s majority opinion neatly distinguished the issue in Hazelwood from Tinker. According to Justice White, “The question whether the First Amendment requires a school to tolerate particular student speech – the question that we addressed in Tinker – is different from the question whether the First Amendment requires a school affirmatively to promote particular student speech” (Hazelwood 1988, pp. 270-271). While schools might need to tolerate student armbands, they were under no obligation to provide a platform such as a school newspaper for student speech. School officials “do not offend the First Amendment,” Justice White concluded, “by exercising editorial control over the style and content of speech in school-sponsored expressive activities so long as their actions are reasonably related to legitimate pedagogical purposes” (Hazelwood 1988, p. 273). The other two cases – Bethel v. Fraser (1986) and Morse v. Frederick (2007) – dealt with student speech more directly. In both cases, however, the Justices resolved the case without invoking Tinker’s disruption test. In Bethel v. Fraser (1986), the court considered the case of a student who had been suspended for delivering a sexually suggestive speech nominating another student for a position in student government at a school-wide assembly. Although there was some evidence suggesting the speech was disruptive, Chief Justice Warren Burger stressed the role that schools play in inculcating the “habits and manners of civility” (Bethel 1986, p. 687). While the armband in Tinker dealt with a significant political issue, the speech at issue in Bethel was “vulgar and offensive” (Bethel 1986, p. 683). All of this lead the Chief Justice to conclude that “It was perfectly appropriate for the school to disassociate itself to make the point to the pupils that vulgar speech is wholly inconsistent with the ‘fundamental values’ of public education” (Bethel 1986, p. 685-686). More recently, in Morse v. Frederick (2007), the Supreme Court considered the case of a Joseph Frederick, a high school student who unfurled a 14-foot-long banner with the words “Bong Hits for Jesus” as he and his classmates watched the “Olympic Torch Relay” pass through the streets of Juneau, Alaska, on its way to the 2002 Winter Olympics in Salt Lake City, Utah. Believing the message was intended to promote illegal drug use, Principal Deborah Morse destroyed the banner and suspended Frederick from school. On appeal, a divided Supreme Court upheld Frederick’s suspension while avoiding the question of whether the banner disrupted school activities. Writing for the majority, Chief Justice John Roberts held that “schools make take steps to safeguard those entrusted to their care from speech that can reasonably be regarded as encouraging illegal drug use” (Morse 2007, p. 397). While acknowledging that the banner’s message was cryptic, the majority nonetheless held that it might reasonably be interpreted as promoting illegal drug use. As such, the Chief Justice concluded, “school officials in this case did not violate the First Amendment by confiscating the pro-drug banner and suspending Frederick” (Morse 2007, p. 397). Taken together, these four Supreme Court decisions create a conceptual framework for dealing with the questions raised by student speech. Tinker is the foundation as it holds that student speech is protected so long as it does not interfere with the “rights of other students” or cause a “substantial disruption.” Subsequent decisions have narrowed the scope of protection afforded to student speech by exempting speech in school sponsored publications, by exempting speech which is “vulgar and offensive,” and by exempting speech that advocates illegal drug use. For all other student speech, however, Tinker remains the law of the land. Because of Tinker, public school students have a First Amendment right to wear symbols to communicate political messages so long as the speech does not offend the rights of others or disrupt the school activities. In the four decades since the Tinker decision, federal judges have used the framework created by the Supreme Court to decide “literally dozens” of cases involving student speech (Chemerinsky 2000, p. 542). While Tinker remains good law, many of these lower court decisions have upheld restrictions on student speech. To justify this result, judges frequently cite Tinker as a precedent to warrant the actions of schools officials. This means that a decision that was originally intended to protect student speech is now being cited to justify limiting student speech. This may seem an implausible result, but it neatly illustrates the power of definitional argument. By changing what counts as disruption and who decides whether student speech is disruptive, these decisions have significantly limited the speech rights of students. In Tinker, the Supreme Court held that student speech could be suppressed if it would “substantially interfere with the work of the school or impinge upon the rights of other students” (Tinker 1969, p. 508). Given how little time Justice Fortas devoted to the “rights of others” in his decision, this element of Tinker has received little scholarly attention. Douglas Frederick (2007) has gone so far as to suggest that the “rights of others” test was never applied by the Supreme Court and is, therefore, nothing more than dicta by the Tinker Court” (p. 492). To date, Harper v. Poway Unified School District (9th Cir. 2006) is the only decision in which a federal court used the “rights of others” test to limit student speech (Lau 2007, pp. 366-367). Many decisions invoking the language of Tinker do not even mention the rights-of-others exception (Calvert 2008-2009, p. 1182). While Justice Fortas offered a stirring defense of student speech rights, his opinion does not offer a clear standard for assessing student speech. In one oft-quoted passage, Justice Fortas reasons that speech is protected unless “the forbidden conduct would ‘materially and substantially interfere with the requirements of appropriate discipline in the operation of the school’” (Tinker 1969, p. 509). Working with this theme, Justice Fortas uses the following iterations in the pages that followed: “material and substantial interference with schoolwork or discipline” (Tinker 1969, p. 511), “materially and substantially interfer[ing] with the requirements of appropriate discipline in the operation of the school” (Tinker 1969, p. 513), “materially disrupts classwork or involves substantial disorder” (Tinker 1969, p. 513), and “substantial disruption of or material interference with school activities” (Tinker 1969, p. 514). Not surprisingly, the ambiguity inherent in the disruption test has led to conflicting interpretations. As originally framed by Justice Fortas, the disruption test protected student speech and required school officials to demonstrate that the speech at issue had materially and substantially interfered with the learning process. An example of the rigorous application of the Tinker standard can be found in Burch v. Barker (1988), a Ninth Circuit Court of Appeals decision that dealt with a school district policy that required high school students to submit all student-authored content to school officials for review before it could be distributed at school events. When students distributed 350 copies of Bad Astra at the senior class barbecue held on school grounds, they were formally reprimanded by the principal who had not previously approved the content of the unauthorized newspaper. The students challenged the principal’s decision as a violation of their First Amendment rights and the Ninth Circuit Court of Appeals ruled in their favor. To justify this outcome, the Ninth Circuit rigorously applied the standard set out by Justice Fortas. In the words of the court, “Tinker cautioned that before deciding that school interference is warranted courts should look to concrete evidence of disturbance or disruption resulting or potentially resulting from specific expression” (Burch 1988, p. 1153). Since the decision hinged on the factual question of whether there was actual disruption, the Ninth Circuit took particular care when recounting the evidentiary record. Rather than responding to actual disruption caused by the content of so-called “underground” newspapers, school officials had acted proactively and implemented a prior review policy. This was the very sort of speculative reasoning that originally led the Des Moines School District to ban political protest. To support this claim, the Ninth Circuit cited the passage in Tinker where the Supreme Court held the “undifferentiated fear or apprehension of disturbance is not enough to overcome the right to freedom of expression” (Burch 1988, p. 1153, quoting Tinker 1969, pp. 508-509). In this case there was, simply put, no proof of actual disruption. If anything, the Ninth Circuit concluded, “this policy [of prepublication review] appears to be based upon far less justification than the action of the school principals in Tinker, which was directed as specific expression in an atmosphere of political turmoil” (Burch 1988, p. 1154). Decisions like Burch are, however, an anomaly. In the majority of the student speech cases, lower federal courts have sided with school officials. What is particularly interesting, however, is the way in which these decisions invoke Tinker to justify limiting student speech. While the shear number of cases makes generalizations difficult, most of these decisions feature one of two distinct argumentative moves. The first of these moves is a subtle change in the definition of disruption. In Tinker, the Supreme Court required either a “substantial disruption” or some form of “material interference.” Rather than rigorously applying this standard, federal courts have ruled in favor of school officials claiming that they acted preemptively to prevent an anticipated disruption. One early case clearly featuring this definitional move is Guzick v. Drebus (6th Cir. 1970). Like the students in Tinker, Thomas Guzick, Jr., sought to express his opposition to the Vietnam War. Instead of an armband, Guzick wore a button soliciting participation in an anti-war demonstration to be held in Chicago on April 5, 1969. This sort of advocacy was expressly banned at Shaw High School in East Cleveland, Ohio, which had a longstanding policy that prohibited students from wearing “buttons, badges, scarves, and other means whereby the wearers identify themselves as supports of a cause or bearing messages unrelated to their education” (Guzick 1970, p. 596). When Guzick refused to remove his button, he was suspended from school by Principal Drebus until such time as he agreed to abide by the school’s policy. Guzick appealed and, based solely on the factual record, one might expect him to prevail as he was asked to remove the button based solely on the “undifferentiated fear or apprehension of disturbance.” The principal acted because of the potential for trouble, not in response to what actually transpired. This was not, however, how the case was ultimately decided. While acknowledging that there was no proof of actual disruption, both the federal district court and the Sixth Circuit Court of Appeals ruled in favor of the principal. To justify this result, both decisions necessarily broadened the definition of disruption. While Tinker had cautioned against limiting speech based on the “undifferentiated fear or apprehension of disturbance,” the Sixth Circuit concluded that the risk was real because “the wearing of buttons and other emblems and insignia has occasioned substantial disruptive conduct it the past at Shaw High. It is likely to occasion such conduct if permitted henceforth” (Guzick 1970, p. 599, quoting Guzick 1969, p. 479). The no-symbol rule was imminently reasonable, the Sixth Circuit concluded, because anticipated disruption posed a real risk. In the words of the Court, “Surely those charged with providing a place and atmosphere for educating young Americans should not have to fashion their disciplinary rules only after good order has been at least once demolished” (Guzick 1970, p. 600). At first blush, the distinction between “substantial and material disruption” and the “reasonable expectation” of disruption may appear trivial. Under closer scrutiny, however, it becomes clear that this is meaningful change in the standard for assessing student speech. Justice Fortas wanted proof that the speech caused a substantial and material disruption, not a theory alleging that the speech at issue had the potential to disrupt classroom instruction or school activities. Under such a relaxed standard, Frank LoMonte (2008-2009) complains, Tinker is nothing more than an “empty proposition” which holds “that as long as the government acts somewhere in the vicinity of reasonableness, it may freely, without fear of reprisal, regulate the content of student speech” (p. 1324). The second move does not involve a definition, but rather considers who has the power to define. In Tinker, it should be remembered, Justice Fortas used the evidentiary record to demonstrate that there was no disruption. There is, however, a larger constitutional issue. Rather than deferring to school officials, the majority opinion in Tinker suggests that judges must carefully review the claims of school officials and independently determine whether there is sufficient evidence to justify suppressing student speech. On this point, C. Thomas Dienes and Annemargaret Connolly (1989) have observed, “the language and spirit of Tinker is not judicial avoidance, nor judicial deference under a rationality standard. . . . Instead, the Court demands substantial government justification for the burdens that school officials impose on student speech” (p. 359). Justice Black’s dissenting opinion in Tinker is noteworthy because he claims, “the Court arrogates to itself, rather than to the State’s elected officials charged with running the schools, the decision as to which school disciplinary regulations are ‘reasonable’” (Tinker 1969, p. 517). Rather than empowering judges to oversee public schools, Justice Black would willingly defer to the authority of school officials. To do otherwise, he warns, would cause irreparable harm to the educational system: “And I repeat that if the time has come when pupils of state-supported schools, kindergartens, grammar schools, or high schools, can defy and flout orders of school officials to keep their minds on their own schoolwork, it is the beginning of a new revolutionary era of permissiveness in this country fostered by the judiciary” (Tinker 1969, p. 518). In the discussion of the definition of disruption, it is easy to miss the importance of who has the power to define. According to Justice Fortas, judges should rigorously review claims by school officials that student speech is disruptive. Under the opposing view espoused by Justice Black, courts should generally defer to school officials. While Justice Fortas wrote for the majority, Justice Black’s position has prevailed in subsequent cases involving student speech rights. This shift in thinking is particularly evident in the Supreme Court’s decision Bethel v. Fraser (1986), where Chief Justice Burger argued “the determination of what manner of speech in the classroom or in school assembly is inappropriate properly rests with the school board” (p. 683). Justice Byron White cited this passage with approval in the majority opinion in Hazelwood v. Kuhlmeier (1988). Lower courts have followed this lead while broadening the definition of disruption, essentially guaranteeing victory for school officials in cases that are litigated (Chemerinsky 2004-2005, p. 127). One case that clearly illustrates the deference to school officials is Poling v. Murphy (6th Cir. 1989), a case involving a student running for president of the student body at Unicoi County High School, in Erwin, Tennessee. At an all school assembly prior to the election, Dean Poling delivered a speech in which he challenged his classmates: “If you want to break the iron grip of this school, vote for me for President. I can try to bring back student rights that you have missed and maybe get things that you have always wanted. All you have to do is vote for me, Dean Poling” (Poling 1989, p. 759). Not surprisingly, his classmates stood and loudly cheered Poling, much as they responded to appeals from the other candidates. Principal Ellis Murphy and other officials were upset because the speech included an unflattering reference to the assistant principal. Poling was not suspended, but the principal disqualified him from serving in student government. Since it would have been expensive to create new ballots without Poling’s name, students were informed that any votes cast for Poling would not be tallied. Rather than appealing his disqualification to the school board, the Poling family brought a civil rights action against Murphy and the board of education. The Sixth Circuit Court of Appeals upheld the decision to disqualify Poling and distinguished between pure student speech (such as Tinker’s armband) and expressive activities (such as school newspapers and assemblies) that are sponsored by the school. What is more interesting, however, is the surprisingly amount of deference that the Sixth Circuit was willing to show to local officials. In the decisive passage, the Sixth Circuit writes: “Local school officials, better attuned than we to the concerns of the parents/taxpayers who employ them, must obviously be accorded wide latitude in choosing which pedagogical values to emphasize, and in choosing the means through which those values are to be promoted. We may disagree with the choices, but unless they are beyond the constitutional pale we have no warrant to interfere with them” (Poling 1989, p. 763). Such deference is arguably as important as the definition of disruption. If courts are unwilling to review decisions made by school officials, student speech will always be disruptive and seldom worthy of First Amendment protection. Taken together, these two definitional moves have undermined the promise implicit in the original Tinker decision. Under the current interpretation, the only student speech worthy of constitutional protection is so innocuous that there is absolutely no evidence that would support a reasonable finding of potential disruption. Federal judges are generally content to defer to the judgment of school authorities and have shown little interest in independently reviewing these decisions. Several students expressed their opposition to the uniform policy and the way in which it was being enforced by wearing black armbands to school on October 6, 2006. Although the armbands did not cover the uniform, the students were disciplined because school officials believed they were trying to thwart the policy. Citing Tinker, the students challenged their suspension. When the case went to trial, the school district admitted that the students were punished because “the black armbands signified disagreement with the student apparel policy” (Lowry 2008, p. 757). More significantly, the school district also stipulated that the black armbands caused “no material disruption or substantial interference with the school” (Lowry 2008, p. 757). The similarity between the students in Lowry and the students in Tinker was not lost on the court. While the school district tried various arguments to distinguish Tinker, the 8th Circuit was not persuaded. The court held the distinction between protesting the Vietnam War and the dress code was “immaterial” (Lowry 2008, p. 760). So too, the court was not convinced that there was a meaningful distinction between a policy intended to prevent a rumored protest (Tinker) and a ban on efforts to undermine uniformity that was adopted before any mention of a protest (Lowry). “We hold that Tinker is so similar in all constitutionally relevant facts,” the 8th Circuit concluded, “that its holding is dispositive” (Lowry 2008, p. 761). While the student’s armbands were ultimately protected in Lowry, the opinion suggests that this is because the facts “nearly mirror Tinker” (Lowry 2008, p. 759). In the majority of student speech cases, however, the courts ultimately rule in favor of schools. This judgment is substantiated by expert opinion (Chemerinsky 1999-2000, 2004; Nuttall 2008; and Yudof 1995) and by academic studies (D’Angelo and Zirkel 2008). “Where students won,” Nuttall (2008) concludes, “the factual situations tended to resemble Tinker closely, to involve other constitutional rights as well, or to make a showing of potential disruption nearly impossible (for example, when the speech occurred away from the school)” (p. 1300). While the reasoning in the individual cases defers, the decisions hinge on the definition of disruption and how much deference is shown to school officials. If this analysis is correct, the future of student speech rights can only be characterized as dismal. When the case was decided in 1969, Tinker was heralded as a great victory for students and for the First Amendment. Over the ensuing decades, however, the precedent has been devalued by a series of lower court decisions that weaken the definition of disruption. At the same time, these decisions show great deference to the judgment of school officials. Because of this development, Chemerinsky laments, the courts have effectively “deconstitutionalized” the First Amendment as it pertains to public school students. (Chemerinsky 2004, p. 127). “The Supreme Court’s position has evolved (actually, devolved) so much since 1969,” Thomas C. Fischer (1993) concludes, “that Tinker has been rendered nearly obsolete, although never explicitly overruled” (p. 1993). The final legacy of Tinker, Perry A. Zirkel (2009) warns, will likely be more “symbolic” than “substantial” (p. 602). This explains why, as Chemerinsky (1999-2000) has aptly noted, “thirty years after Tinker, students do leave most of their First Amendment rights at the schoolhouse gate” (p. 546). While scholars may debate the weight that should be given to the speech rights of students, the Tinker decision and its progeny remain a fascinating case study illustrating the power of definitional argument. By broadening the definition to include the potential for disruption, federal judges transformed a precedent that protected students into a precedent that can be used to suppress student speech. Writing about the power of such argumentative moves, Edward Schiappa (1993) noted that “a successful new definition changes not only recognizable patterns of behavior, but also our understanding of the world” (pp. 406-407). In this case, the new definition changed schools from a vibrant forum for students to explore new ideas into dour institutions devoted to the indoctrination of the young and the inculcation of a particular set of preferred values. The original definition of disruption offered by Justice Fortas in the majority opinion emphasized the importance of individual rights, whereas the new definition emphasizes the importance of socialization and conformity valued by Justice Black in his dissenting opinion. Blasi, V., ed. (1983). The Burger Court: The counter-revolution that wasn’t. New Haven, Conn.: Yale University Press. Burch v. Barker, 861 F.2d 1149 (9th Cir. 1988). Calvert, C. (2008-2009). Tinker’s midlife crisis: Tattered and transgressed but still standing. American University Law Review 58, 1167-1191. Chemerinsky, E. (1999-2000). Students do leave their First Amendment rights at the schoolhouse gates: What’s left of Tinker? Drake Law Review 48, 527-546. Chemerinsky, E. (2004). The deconstitutionalization of education. Loyola University Chicago Law Journal 36, 111-135. Chemerinsky, E. (2007). Turning sharply to the right. Green Bag 2d 10, 423-438. D’Angelo, A., & Zirkel, P. A. (2008). An outcomes analysis of student-initiated litigation. West’s Education Law Reporter 226, 539-551. Dienes, C. T., & Connolly, A. (1989). When students speak: Judicial review in the academic marketplace. Yale Law and Policy Review 7, 343-395. Dupre, A. P. (2009). Speaking up: The unintended costs of free speech in public schools. Cambridge, Mass. : Harvard University Press. Fischer, T. C. (1993). Whatever happened to Mary Beth Tinker and other sagas in the academic “marketplace of ideas.” Golden Gate University Law Review 23, 352-412. Frederick, D. D. (2007). Restricting student speech that invades others’ rights: A novel interpretation of student speech jurisprudence in Harper v. Poway Unified School District. University of Hawaii Law Review 29, 479-500. Guzick v. Drebus, 431 F.2d 594 (6th Cir. 1970). Harper v. Poway Unified School District, 445 F.3d 1166 (9th Cir. 2006). Horowitz, M. (1998). The Warren Court and the pursuit of justice. New York: Hill and Wang. Lau, H. (2007). Pluralism: A principle for children’s rights. Harvard Civil Rights-Civil Liberties Law Review 42, 317-372. LoMonte, F. D. (2008-2009). Shrinking Tinker: Students are “persons” under our constitution – except when they aren’t. American University Law Review 58, 1323-1359. Lowry v. Watson Chapel School District, 540 F.3d 752 (8th Cir. 2008). Miller, A. D. M. (2002). Balancing school authority and student expression. Baylor Law Review 54, 623-675. Nuttall, S. R. (2008). Rethinking the narrative on judicial deference in student speech cases. New York University Law Review 83, 1282-1323. Nuxoll v. Indian Prairie School District, 523 F.3d 668 (7th Cir. 2008). Papandrea, M. (2007, June 26). U.S. Supreme Court limits student speech rights. Retrieved from http://www.citmedialaw.org/u-s-supreme-court-limits-student-speech-rights. Perelman, C. and Olbrechts-Tyteca, L. (1969). The New Rhetoric. (J. Wilkinson and P. Weaver, Trans.). Notre Dame, In. : University of Notre Dame Press. Poling v. Murphy, 872 F.2d 757 (6th Cir. 1989). Savage, D. G. (1992). Turning Right: The making of the Rehnquist Supreme Court. New York: Wiley. Schiappa, E. (1993). Arguing about definitions. Argumentation 7, 403-418. Schiappa, E. (2001). What is golf? Pragmatic essentializing and definitional argument in PGA Tour, Inc. v. Martin. Argumentation and Advocacy 38, 18-27. Stevenson, C. L. (1938). Persuasive definitions. Mind 47, 331-350. Stevenson, C. L. (1944). Ethics and language. New Haven, Conn.: Yale University Press. Tinker v. Des Moines Independent Community School District, 258 F. Supp. 971 (S.D. Iowa 1966). Tinker v. Des Moines Independent Community School District, 383 F.2d 988 (8th Cir. 1967). Yudof, M. G. (1995). Tinker tailored: Good faith, civility, and student expression. St. John’s Law Review 69, 365-377. Zarefsky, D. (1998.) Definitions. In J. F. Klumpp (ed. ), Argument in a time of change: Definitions, frameworks, and critiques (pp. 1-11). Annandale, Va.: National Communication Association. Zirkel, P. A. (2009). The rocket’s red glare: The largely errant and deflected flight of Tinker. Journal of Law and Education 38, 593-602.